← Engrish of the Week! NEW Summer Pepsi — Caribbean Gold! A few weeks ago I posted about how disappointing this year’s Summer Pepsi offering was, and how it didn’t seem very summery at all. Well, as luck would have it, there’s a new Summer Pepsi on the block! Caribbean Gold, with White Sapote Flavor! Uh, what now? Now I’m pretty sure that very few people in Japan have ever tried, or even heard of the White Sapote fruit. This is probably Pepsi’s clever ploy to make sure there isn’t a legion of naysayers complaining about flavor inaccuracy. Is this what White Sapote tastes like? Sure! I’ll believe you! In fact, according to Wikipedia, the flavor “can range in flavor from bland to banana-like to peach to pear to vanilla flan.” They’re really hedging their bets on this one! No, no, this is the peachy vanilla White Sapote, not the banana pearish type! It does taste vaguely fruity, though at first I thought it tasted a bit like an energy drink. I was surprised to find out that the White Sapote is actually famous for it’s supposed narcotic properties. Apparently it can make the eater quite drowsy! I’ve always had trouble falling asleep, so I’d love to get my hands on the actual fruit to test it out. So far the soda hasn’t put me to sleep, but doesn’t seem to have me buzzing like Red Bull would either! It reminds me a bit of last summer’s Baobab (another flavor unlikely to be recognized in Japan, hmmm…) It may be wishful thinking on my part, or maybe it’s the Caribbean connection, but it also reminds me a touch of my beloved Goombay Punch from the Bahamas as well. The bottle is super cute, covered in seahorses, palm trees, ukeleles, and all the trappings of a lovely Caribbean vacation. This bottle is about as close as I’m going to get to the Caribbean this summer, so I guess I’ll have to make do. I probably won’t drink it every day, but overall it’s quite nice and worlds better than that vile Pepsi Dry! Have you tried it? Would you like to? More importantly, has anyone tried the mysterious White Sapote, and does it really make you drowsy, like the internet tells me? Inquiring minds must know! This entry was posted in Food! and tagged caribbean, fruit, Pepsi, soda, sweet. Bookmark the permalink. 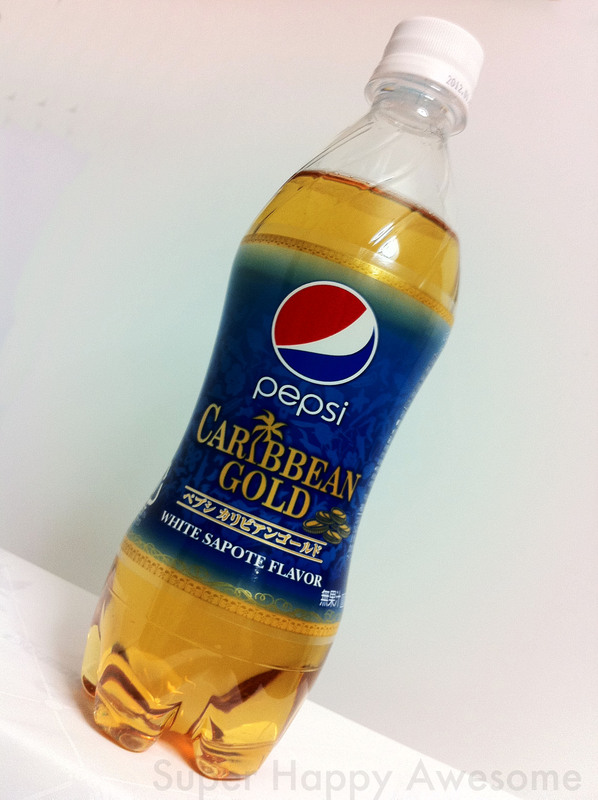 6 Responses to NEW Summer Pepsi — Caribbean Gold! I do miss the specialty drinks in Japan. I tried Pepsi Baobab last summer and it tasted awful. Though the color is suspect to me, the flavor seems to sound good (I love vanilla). Please keep posting about specialty drinks found in Japan. I haven’t had the fruit, but I have really enjoyed the soda. Though its not as high on my list as the Mont Blanc from Christmas. Hey, very interesting flavour. I love how Asia, especially Japan, has different varieties of (soda) pop. I just came back from Hong Kong where they had Green Tea Sprite. But Caribbean Gold, with White Sapote Flavor is as random as it can get – which is great! I had some last time I was in Tokyo and I liked it. It was interesting, although I agree it’s not something I’d drink every day. I thought it kind of tasted like bubblegum. I’m not sure if that’s a positive or a negative, but that’s what I got out of it. It does kind of taste like bubblegum! I hadn’t thought of that, you’re right!